Written by Geoff Johns; Art by Mike McKone, Marlo Alquiza, Tom Grummett, Ivan Reis, Kevin Conrad, Marc Campos, and Norm Rapmund; Cover by McKone and Alquiza Raven returns...with a new body, but also a new master: the latest Brother Blood! 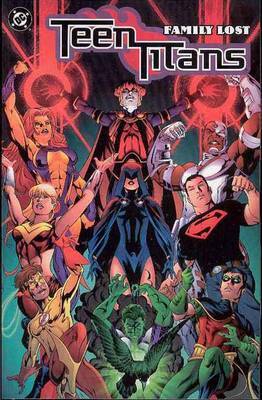 The newest adventures of everyone's favorite teen team of heroes unfolds in TEEN TITANS: FAMILY LOST, a 176-page softcover collecting TEEN TITANS #8-12, plus the hard to find TITANS #1/2. This collection is written by Geoff Johns (JSA, FLASH) with art by the acclaimed team of Mike McKone (Exiles) and Marlo Alquiza (SUPERMAN), and additional art by Tom Grummett, Ivan Reis, Kevin Conrad, Marc Campos, and Norm Rapmund. Deathstroke's daughter, Rose Wilson assumes the identity of the Ravager and switches from Titans ally to Titans threat. Now Deathstroke and Rose hunt for the Titans. Could things get any more explosive? They do, when Kid Flash learns to drive!